"Not much beats a good hoody. Ours is wool Merino made for uncompromising comfort. We’ve incorporated years of feedback and design intention to capture a natural fiber layer that is perfect for post-gym cool down, morning warm up, or all-purpose travel layers. With thumbholes for easy layering, this is a soon-to-be favorite. Finely tuned 18.5 micron New Zealand Merino at 195g/m2. We designed this fabric from the need of a weight in-between our Woolies 1 at 150g/m2 and our Woolies 2 at 230g/m2. The weight of the fabric resembles that of a high quality t-shirt. 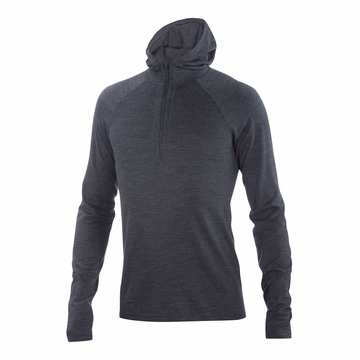 It works well worn next to skin as a baselayer or on it's own."